Beautiful stuff man, some really great photos too. Merry Christmas everyone, a little tribute to the men who have served and made the world free from Tyranny. Great work and pics - please keep them coming! USAAF ground crew write " Happy Easter to Adolph", sorry couldn't find much details about this picture. A civilian worker watches a C-46 in flight, 1333rd AAF Base Unit, Chabua, India, ca November 1944. (NA) Very closed to my home state. wow that is some great colorizing Tom......you are good. now back to your model building you slacker! Great work Tom, and thanks for sharing! 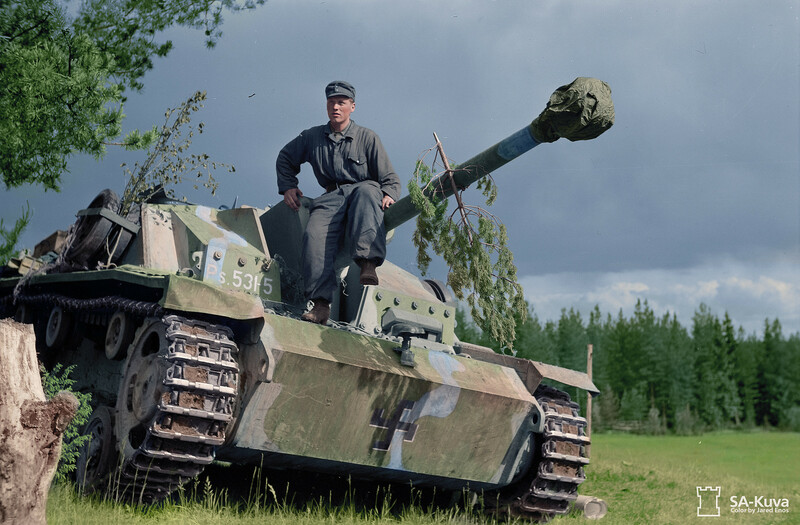 A Finnish soldier sits atop a StuG III assault gun the day after the Battle of Tienhaara, June 23, 1944. Colorized by Jared Enos (not me) < more colorized pics behind the link.